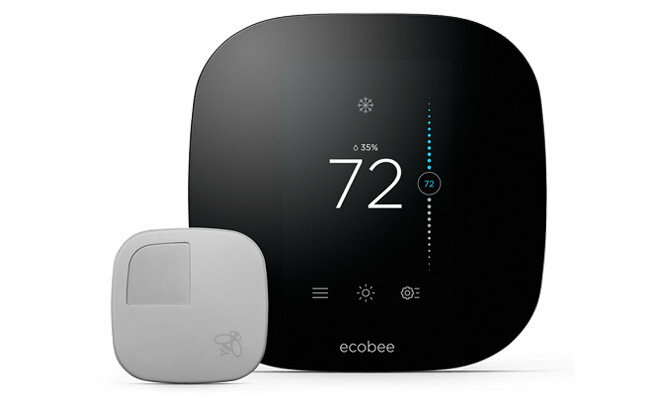 Apple online and brick-and-mortar stores on Tuesday will start selling ecobee3, the first Internet-connected thermostat compatible with Apple's iOS-based HomeKit framework. As noted by The Verge, the $249 ecobee3 is one of the first smart thermostats to feature support for Apple's connected home platform. A version of ecobee3 is already on sale, but lacks wireless chipsets certified for use with the HomeKit ecosystem. Ecobee3 functions much like Nest's Learning Thermostat and is capable of controlling a home's HVAC system remotely through geofence triggering, Siri voice input, scheduling and in-app parameters. For smart home monitoring, the system relies on specialized sensors that feed information about room temperature and occupancy to ecobee3's control unit. HomeKit promises iOS device users remote control over compatible smart home appliances, which at this early stage is limited to HVAC and lighting fixtures. Future implementations are expected to include door locks, alarm systems, garage doors and more. The first wave of HomeKit products came from established industry names like Insteon, iHome and Lutron, which announced availability of lighting control hardware last month. Initial reviews have been lukewarm, however, as Apple's Siri-reliant control scheme is at times unreliable. AppleInsider went hands-on with Lutron's Caseta Wireless dimmer switch and came away impressed by the hardware's potential, but disappointed at HomeKit's somewhat buggy user experience. While not confirmed, it seems ecobee might be phasing out the original ecobee3 once the HomeKit version sees wide release, as the company is dropping prices on older models by $20. The lower price is already live at authorized resellers Best Buy and Amazon.